طالع زاده لاری, علی, نیک بخت, علی, صدیقی, مجتبی. (1394). مسئله تماس لغزشی پانچ صلب استوانه‌ای و جسم نیمه بی‌نهایت هدفمند در حضور ترک سطحی. 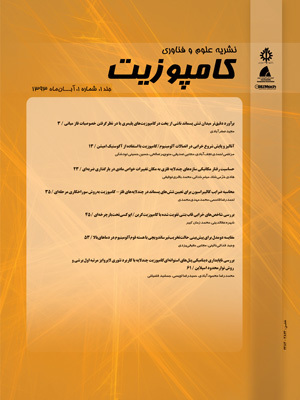 علوم و فناوری کامپوزیت, 2(3), 11-22. علی طالع زاده لاری; علی نیک بخت; مجتبی صدیقی. "مسئله تماس لغزشی پانچ صلب استوانه‌ای و جسم نیمه بی‌نهایت هدفمند در حضور ترک سطحی". علوم و فناوری کامپوزیت, 2, 3, 1394, 11-22. طالع زاده لاری, علی, نیک بخت, علی, صدیقی, مجتبی. (1394). 'مسئله تماس لغزشی پانچ صلب استوانه‌ای و جسم نیمه بی‌نهایت هدفمند در حضور ترک سطحی', علوم و فناوری کامپوزیت, 2(3), pp. 11-22. طالع زاده لاری, علی, نیک بخت, علی, صدیقی, مجتبی. مسئله تماس لغزشی پانچ صلب استوانه‌ای و جسم نیمه بی‌نهایت هدفمند در حضور ترک سطحی. علوم و فناوری کامپوزیت, 1394; 2(3): 11-22. در این مقاله تماس لغزشی دوبعدی یک پانچ صلب استوانه‌ای روی یک سطح نیمه بی‌نهایت ساخته شده از مواد هدفمند در حضور و عدم حضور یک ترک سطحی بررسی شده است. مدول الاستیسیته در لایه هدفمند طبق مدل تی-تی-او محاسبه شده است. این مدل با تعریف پارامتر q، تاثیر برهم‌کنش‌های ریزساختارها را نیز در نظر می‌گیرد. برای حل معادلات حاکم از کد نویسی روش تفاضلات محدود در نرم‌افزار متلب استفاده شده است. اثر ناهمگنی، q، شعاع پانچ، ضخامت لایه هدفمند و ضریب اصطکاک بر نمودار نیرو – جابه‌جایی، تنش‌های ایجاد شده و ضرایب شدت تنش مود اول و دوم بررسی شده است. نتایج به‌دست آمده نشان می‌دهد که افزایش ضخامت لایه هدفمند، شعاع پانچ و ضریب ناهمگنی(r) برای جابه‌جایی‌های یکسان پانچ افزایش نیروی تماس را در پی دارد. همچنین تغییرات این پارامترها بر توزیع تنش فشاری زیر پانچ موثر است. اما تغییرات q تاثیری بر نیروی تماس و نیز توزیع تنش فشاری ندارد. در تماس بدون اصطکاک ضریب شدت تنش مود اول همواره نامثبت است و ترک تمایلی به رشد تحت این مود ندارد. افزایش ضریب اصطکاک، ضریب شدت تنش مود اول را افزایش می‌دهد؛ اما موجب کاهش ضریب شدت تنش مود دوم می‌شود. In this article two dimensional sliding contact of a rigid cylindrical punch on a functionally graded (FG) semi-infinite medium is studied. The modulus of elasticity in the graded layer is calculated based on TTO model approximation. This model defines a parameter q which considers the microstructural interactions between the constituting phases. The governing equations are solved by finite difference (FD) method by means of MATLAB software. The effects of different parameters such as non-homogeneity­, q, the dimensions of the punch, the thickness of the graded layer and the coefficient of friction are investigated on the force-displacement diagram of the punch, stress distribution and modes I and II stress intensify factors (KI and KII). The results show that the contact force and the stress distribution under the punch are affected by the thickness of the graded layer, radius of the punch and the non-homogeneity­ coefficient. But the variation of q has no effects on the contact force and the stress distribution under the punch. In the absence of the friction, KI is always non-positive and the crack has no tendency to grow under this mode. Increasing the friction coefficient, increases KI but decreases KII. Sahin, A., “An Interface Crack for a Graded Coating Bonded to Layered Medium,” Ph.D Thesis, Lehigh University, Pennsylvania, USA. , 2002. Hertz, H., “Uber die Berührung fester elastischer Körper, Journal für die reine und angewandte Mathematik,” Vol. 8, No. 92, pp. 297-306, 1882. Giannakopoulos, A. and Pallot, P., “Two-dimensional contact analysis of elastic graded materials,” Journal of the Mechanics and Physics of Solids, Vol. 48, No. 8, pp. 1597-1631, 2000. Aizikovich, S. Alexandrov, V. Kalker, J. Krenev, L. and Trubchik, I. “Analytical solution of the spherical indentation problem for a half-space with gradients with the depth elastic properties,” International Journal of Solids and Structures, Vol. 39, No. 10, pp. 2745-2772, 2002. Ke, L. L. and Wang, Y. S., “Two-dimensional contact mechanics of functionally graded materials with arbitrary spatial variations of material properties,” International Journal of Solids and Structures, Vol. 43, No. 18, pp. 5779-5798, 2006. Ke, L. L. and Wang, Y. S., “Two-dimensional sliding frictional contact of functionally graded materials,” European Journal of Mechanics-A/Solids, Vol. 26, No. 1, pp. 171-188, 2007. Guler, M. and Erdogan, F., “The frictional sliding contact problems of rigid parabolic and cylindrical stamps on graded coatings,” International journal of mechanical sciences, Vol. 49, No. 2, pp. 161-182, 2007. Dag, S. Guler, M. A. Yildirim, B. and Cihan Ozatag, A., “Sliding frictional contact between a rigid punch and a laterally graded elastic medium,” International Journal of Solids and Structures, Vol. 46, No. 22, pp. 4038-4053, 2009. Dag, S. Guler, M. A., Yildirim, B. and Ozatag, A. C., “Frictional Hertzian contact between a laterally graded elastic medium and a rigid circular stamp,” Acta Mechanica, Vol. 224, No. 8, pp. 1773-1789, 2013. Gun, H. and Gao, X.-W., “Analysis of frictional contact problems for functionally graded materials using BEM,” Engineering Analysis with Boundary Elements, Vol. 38, pp. 1-7, 2014. Erdogan, F., “Fracture mechanics of functionally graded materials,” Composites Engineering, Vol. 5, No. 7, pp. 753-770, 1995. Jin, Z. H. and Batra, R., “Some basic fracture mechanics concepts in functionally graded materials,” Journal of the Mechanics and Physics of Solids, Vol. 44, No. 8, pp. 1221-1235, 1996. Erdogan, F. and Wu, B., “Crack problems in FGM layers under thermal stresses,” Journal of thermal stresses, Vol. 19, No. 3, pp. 237-265, 1996. Erdogan, F. and Wu, B., “The surface crack problem for a plate with functionally graded properties,” Journal of Applied Mechanics, Vol. 64, No. 3, pp. 449-456, 1997. Choi, H. J., “ The problem for bonded half-planes containing a crack at an arbitrary angle to the graded interfacial zone,” International Journal of Solids and Structures, Vol. 38, No. 36, pp. 6559-6588, 2001. Walters, M. C. Paulino, G. H. and Dodds, R. H., “Stress-intensity factors for surface cracks in functionally graded materials under mode-I thermomechanical loading,” International Journal of Solids and Structures, Vol. 41, No. 3, pp. 1081-1118, 2004. Dag, S., “Thermal fracture analysis of orthotropic functionally graded materials using an equivalent domain integral approach,” Engineering fracture mechanics, Vol. 73, No. 18, pp. 2802-2828, 2006. Dag, S. Yildirim, B. and Sarikaya, D., “Mixed-mode fracture analysis of orthotropic functionally graded materials under mechanical and thermal loads,” International Journal of Solids and Structures, Vol. 44, No. 24, pp. 7816-7840, 2007. Dag, S. Erhan Arman, E. and Yildirim, B., “Computation of thermal fracture parameters for orthotropic functionally graded materials using Jk-integral,” International Journal of Solids and Structures, Vol. 47, No. 25–26, pp. 3480-3488, 2010. Dag, S. “Crack and Contact Problems in Graded Materials,” Ph.D Thesis, , Lehigh University, USA, 2001. Dag, S. and Erdogan, F., “A surface crack in a graded medium loaded by a sliding rigid stamp,” Engineering Fracture Mechanics, Vol. 69, No. 14, pp. 1729-1751, 2002. Choi, H. J. “Effects of graded layering on the tip behavior of a vertical crack in a substrate under frictional Hertzian contact,” Engineering fracture mechanics, Vol. 68, No. 8, pp. 1033-1059, 2001. Choi, H. J. and Paulino, G. H., “Interfacial cracking in a graded coating/substrate system loaded by a frictional sliding flat punch,” Proceedings of the Royal Society A: Mathematical, Physical and Engineering Science, Vol. 466, No. 2115, pp. 853-880, 2010. Dag, S. Apatay, T. Guler, M. A. and Gulgeç, M., “A surface crack in a graded coating subjected to sliding frictional contact,” Engineering Fracture Mechanics, Vol. 80, pp. 72-91, 2012. Liebowitz, H. Sandhu, J. Lee, J. and Menandro, F., “Computational fracture mechanics: research and application,” Engineering fracture mechanics, Vol. 50, No. 5-6, pp. 653-670, 1995. Altus, E. and Bar-Yoseph, P., “A 3-D finite difference solution for orthotropic laminated composites using curvilinear coordinates,” Computers & Structures, Vol. 17, No. 4, pp. 573-577, 1983. Dorogoy, A. and Banks‐Sills, L., “Shear loaded interface crack under the influence of friction: a finite difference solution,” International Journal for Numerical Methods in Engineering, Vol. 59, No. 13, pp. 1749-1780, 2004. Dorogoy, A. and Banks-Sills, L., “Effect of crack face contact and friction on Brazilian disk specimens—A finite difference solution,” Engineering fracture mechanics, Vol. 72, No. 18, pp. 2758-2773, 2005. Guinea, G. V. Planas, J. and Elices, M., “KI evaluation by the displacement extrapolation technique,” Engineering fracture mechanics, Vol. 66, No. 3, pp. 243-255, 2000. Raju, I. and Newman, J., “Three dimensional finite-element analysis of finite-thickness fracture specimens,” NASA TN D-8414, Technical report, Langley Research Center, May 1977. Smith, S. A. and Raju, I. S., “Evaluation of stress-intensity factors using general finite-element models,” Fatigue and Fracture Mechanics (Twenty-Ninth Volume) ASTM STP, Vol. 1332, pp. 176-200, 1999. De Morais, A. B., “Calculation of stress intensity factors by the force method,” Engineering Fracture Mechanics, Vol. 74, No. 5, pp. 739-750, 2007. Talezadehlari, A. and Sadighi, M., “Numerical analysis of the fracture parameters in the sliding contact problem between a rigid flat punch and a functionally graded semi-infinite medium in the presence of a surface crack,” In Persian, Modares Mechanical Engineering, Vol. 13, No. 12, pp. 14-24, 2013. Tamura, I. Tomota, Y. and M. Ozawa, “Strength and ductility of Fe-Ni-C alloys composed of austenite and martensite with various strengths,” in Proc. Conf. on Microstructure and Design of Alloys, Institute of Metals and Iron and Steel Institute, London., Vol. 1, No. 129, pp. 611-615, 1973. Nikbakht, A. Fallahi Arezoodar, A. Sadighi, M. Zucchelli, A. and Talezadehlari, A., “Frictionless elastic contact analysis of a functionally graded vitreous enameled low carbon steel plate and a rigid spherical indenter,” Composite Structures, Vol. 96, pp. 484-501, 2013. Talezadehlari, A., “Analysis of contact problem in high temperature in the presence of cracks in the functionally graded (FGM) layers,” In Persian, MSc Thesis, Amirkabir University of Technology, Iran, 2012.